KODIAK, Alaska -- Now securely perched atop a launch pad in the Gobi desert, China's next foray into space will blast off this week to begin assembly of a miniature space station and demonstrate orbital rendezvous and docking technology. The launch is expected some time this week, potentially Thursday or Friday based on weather conditions in China, according to state media sources. The mission is a milestone for China's space program, coming three years after the country mounted its last manned space expedition and conducted its first spacewalk. Snugly fastened inside the nose of a Long March 2F rocket, the Tiangong 1 module will be positioned several hundred miles above Earth to receive a Shenzhou capsule for docking later this year. Flying without a crew, the Shenzhou 8 craft will approach Tiangong 1 for an automated rendezvous and docking, proving fundamental technologies for China's long-term program to design and build a large 60-ton space station by 2020. Tiangong 1, which means heavenly palace in English, weighs about 19,000 pounds at launch. The solar-powered spacecraft measures between 9 feet and 13 feet wide and nearly 40 feet long. The docked Shenzhou and Tiangong vehicles will form a miniature space station stretching approximately 60 feet long. The docking demo, which is scheduled before the end of the year, will be a crucial accomplishment for China's future space aspirations. The construction and servicing of space stations will require modules to autonomously meet and link up in orbit. Crews aboard two more Shenzhou missions in 2012 will launch to the orbiting laboratory for short-duration stays. The objectives of those missions will include space science, medical and technological experiments. The Tiangong 1 module will remain operational for up to two years, hosting two visiting crews for brief missions. 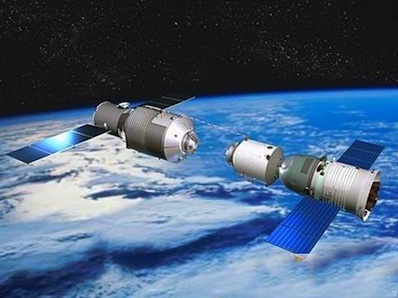 Future Tiangong modules will launch on more ambitious missions with multiple docking ports, then a new series of heavy-lift Long March rockets will start assembly of a space station the size of NASA's Skylab complex from the 1970s. The Xinhua news agency, a state-run media outlet, reported weather conditions at the mission's launch site would be most favorable for liftoff Thursday or Friday. Ground and upper level winds must be within certain constraints for the launch to go ahead. The China Manned Space Engineering Office announced last week the flight would blast off between Tuesday and Friday. The 20-story Long March 2F rocket rolled Tuesday from the vertical assembly facility to the launch pad at the Jiuquan space center, a remote military base in Inner Mongolia, a sparsely-populated province in northwest China's Gobi desert. The mile-long journey atop a mobile launch table coincided with China's official announcement of the impending liftoff. The arid Jiuquan launch site was the point of departure for China's only three manned space missions. Designed for China's human space program, the Long March 2F rocket underwent 170 modifications, including 38 "major" changes to the launcher used three times to send Chinese astronauts into orbit, state media reported. According to Chinese space officials, the upgrades include an enlarged 13.8-foot diameter payload shroud, adding more redundancy, increasing the rocket's injection accuracy and beefing up the launcher to haul more mass into orbit. Most of the individual modifications were unspecified by state media. With final checks of the rocket and spacecraft now complete, workers are awaiting approval to load the Long March 2F with explosive toxic propellant. The rocket burns hydrazine and nitrogen tetroxide in its two core stages and four strap-on boosters. The launch was delayed from late August after the failure of a smaller Long March 2C rocket. Chinese investigators traced the cause of the mishap to the control system in the rocket's second stage, which shares commonality with the Long March 2F launcher used for Tiangong 1 and manned flights.